We offer Ultrapure Water Treatment Plant. Ultrapure water is a kind of water that all conductive mediums have been completely removed and the undissociated colloidal substances, gases and organic matters are reduced to a minimum level. 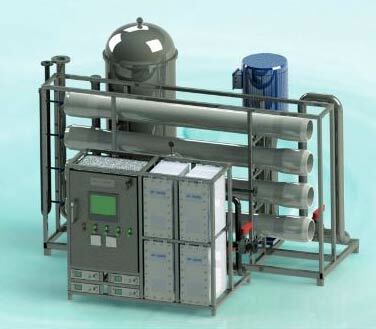 Tritech Ultrapure Water Treatment Plant is fully automated, easy to operate and requires minimal human interference. The most advanced and energy saving RO separation technology as pre-treatment, combined with electro-deionization (EDI) technology. Using EDI module instead of mixed bed has many advantages like advanced process, reliable quality, strong scalability, small footprint, continuous production, no acid-alkaline regeneration and environmentally friendly. Ultra-pure water contains by definition only h20, and h+ and oh- ions in equilibrium. Ultrapure water production often has to be done in 2 steps. From tap water or fresh groundwater, the water should first be demineralised by membrane filtration. This can be done by tritech’s CMF process. The demineralised water is then processed through a high performance electrodionization (EDI). Edi is a process which combines semi-impermeable membrane technology with ion-exchange media to provide a high efficiency demineralization process.